Of course heroes are fighting. It’s Marvel! The story opens mid-battle aboard a retired warship turned museum, the USS Intrepid, as the Heroes battle a group of villains wanting to ransom the boat. They are victorious and Danny has a run-in with Misty Knight. Later, Dane is having a vision of Sersi, trapped somewhere in something called the Vortex. I’m not really up on this character’s history. It’s interrupted when Iron Fist learns that the Controller and the U-Foes are making another move, but it’s a trap set up by the Master Of The World to frame the Controller and punish the U-Foes for trying to push him around. 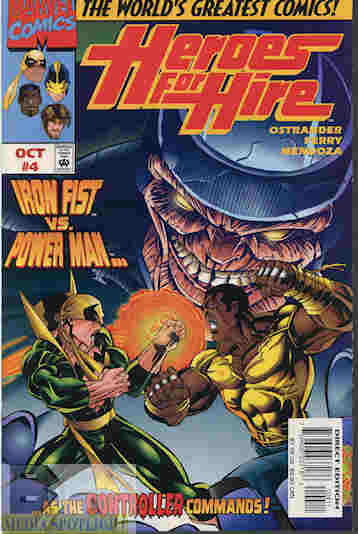 This includes Iron Fist being under “the Controller’s” control (actually Master’s) and attacking Luke Cage. The Heroes are able to free him and the Master rigs the U-Foes’ teleporter to knock them out. Later at Oracle, the Heroes get a surprise visitor…Sersi, warning of something wrong with her fellow Celestials before passing out. What they got right: Some good teamwork by this still-new team and some good fight scenes. There is set up for the long story and presumably the next story arc. As a transition between storylines this works well. What they got wrong: We’re told Vapor snuck the control disk onto Iron Fist during the fight on the Intrepid, but there’s not even a hint of her being there. Did it happen before we the audience arrived? Yes, the narrator chastises us for being late to the battle. Ostrander’s trying to do something different with his narration but all the fourth wall breaking and jokey commentary just feels forced. It’s not something that benefits the story and I don’t think Ostrander’s good at it to begin with. Recommendation: Still an enjoyable book thus far. It’s worth checking out. Posted by ShadowWing Tronix on October 17, 2017 in Marvel Spotlight, Yesterday's Comics and tagged Iron Fist (comics), Luke Cage, Marvel Comics, Marvel Universe, Master Of The World, Misty Knight, The Black Knight, U-Foes.